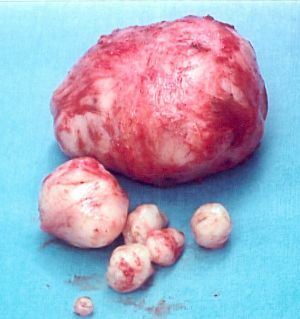 A case Uterine Fibroids aged 40/F having pain in right lumbar region, having Irregular menses every 15 days, 2 day bleeding. Leucorrhoea whitish, low back pain, Pain in right hypochondria radiates to left side. Weakness. Vertigo. Stools are hard, constipated. Thirst is Medium. Left sided heaviness and numbness in lower extremities. Chronic Allergic Rhinitis. Fullness. Nausea and distention in abdomen. Allergic troubles. Itching in eyes. Past History : Recurrent cold. Allergic Rhinitis. Irregular and early menses since 3-4 months. Mental History: Sensitive mood. Hypochondriac. Uterus is bulky in size. Change in shape and echo texture. Anteverted in position. Evidence of focal mass lesion in Anterior wall of fundus 32 X 17 mm in size. Sonography impression Pelvic USG finding signs of Fibroid. - Female; INFLAMMATION; uterus, metritis; fear; from (2) *: phos. - Female; MENSES; frequent, too early, too soon; ten days, every (SRIII-542) (1) **: phos. - Female; MENSES; protracted, prolonged (K728, SRIII-560, G620) (154) **: phos. - Female; METRORRHAGIA; profuse; prolonged (1) *: phos. Nat Phos 6 bd x 2 weeks. Distention and hardness in abdomen decreased. Left sided pain in abdomen decreased. Pain in umbilical region occasionally. During micturition complaints decreased comparatively. Repeating Calc Fl 30 bd x 2 week. Medorrhinum 1 M single dose. Menses Flow increased. Pain in both side of abdomen. Leucorrhoea increased. All complaints due to exertion. Low back pain. weakness. Rx Kali carb 200 single dose given to feel better in menstrual complaints & back pain. Pain in left side of abdomen. Sometime pain in right side of abdomen and right side of lumbar region. after 1 week Calc Fl 30 continued. 4-5 days early menses & profuse. Weakness. Numbness. Burning micturition comparatively decreased. Evidence of moderate to bulky Uterus with decreased myometrial echogenicity. Normal endometrial echocomplex. Anteverted in position. Normal shape. No any Focal lesion . Abdominal USG reveals evidence of Moderate PID. Trilium Q given to control Menorrhagia. Pl bd x 2 weeks. Medicine Ferrum Phos 6 x continued for 2 month for weakness. For acute complains like Dysentry, Coryza and Acidity symptomatic Medicines prescribed. Due to improvement in Menstrual and abdominal complaints Patient was Irregular in Follow up. Now she is having occasionaly Pain in right side of abdomen < heavy exertion. Menses and early but comparatively regular and of short duration. Heavy Uterine bleeding decreased. Some time low back pain. Occasionally burning micturition but comparatively decreased. Kali carb 200 given for complaints of low back pain, weakness. Trilium Q continued 10 drops tds doses. Kali Phos 6 x bd x 2 week. Patient has not came for follow up After 07/03/2006 but Her complaints were comparatively decreased. Occassionall menstrual complaint as she is having PID. But severity of Abdominal complints, low back pain, Lumbar region, Burning micturion decreased. Conclusion: Above case belongs to low Socioeconomic group living in small Village having Material idea in Treatment & results. But having very less Health Awareness. So she can not continue the Follow up due to decreased severity of her disease. In this case Phos 200 has given marked improvement. As she was having Bulky Uterus due to which menses were early & profuse that was relieved with Trilium Q in material doses. Biochemic medicines like Ferrum Phos 6 x and Kali Phos 6 x has given beneficial results in Weakness, Hot flashes and Pre Menopausal complaints. Only sometime for low back pain with weakness I had given kali carb 200. In sycotic nature of case Medorrhinum played very important role.